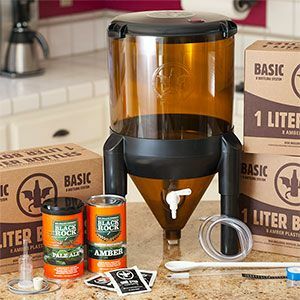 There are so many homebrew starter kits out there that it might be tempting to shop by price or to choose who advertises the most, but most of these home brew kits will disappoint after a couple of batches. There's nothing wrong the kits themselves, and each kit has its pros and cons, but what separates these kits from each other for us is what kind of beer you can make in them. Technically you can make any kind of beer you want in any homebrew setup. What we've discovered though is that the beer kits available for smaller fermenters produce merely okay beer. If your beer lover wants to brew his or her own beer using brew kits from well-known breweries, they'll find they're pre-measured for 5-gallon fermenters. If your beer lover is not a mathematician, then that might get challenging (like splitting a recipe that serves six into recipe for two). For this reason, we recommend the BrewDemon 6-gallon kit (the extra gallon is neither good nor bad, it's just how they sell them). Especially for IPA-lovers. They'll be able to buy beer ingredient kits for famous beers like Pliny the Elder and Firestone Walker DBA.